This isn’t a full-fledged review. While we are creating a name for the most defunct of all systems here at Defunct Games, I thought it prudent to discuss another Nintendo franchise that almost received the Philips treatment. This is merely a mostly playable prototype of the Mario game Philips was working on before it was ultimately cancelled. 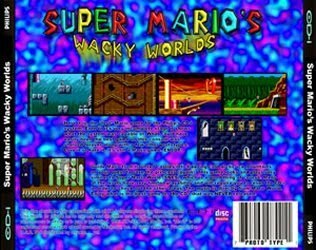 When compared to the horrid interpretation given to the Zelda series by this company, Mario’s Wacky Worlds looked far more promising and may have garnered enough support for Philips to actually sell a couple of systems. But all was for not, and the game never saw completion. If you do own a CD-i, a stroll through eBay should yield a copy of this. Though, mind you, it is an unfinished game. You cannot exit the stage you are in without restarting the system and selecting another unfinished stage (at least, I cannot on my copy). That being said, the stages are interesting to say the least. Though many are a little too real-world inspired for my taste. The opening stages are Greek, Egyptian, and Aztec themed, complete with enemies clad in era-appropriate attire. We’re talking togas and all! The later stages are what give the moniker its Wacky name. Stages like Neon City, Geomotropolis, and the Land O’ Plaid show an interesting departure from Mario’s familiar stomping ground; a departure even from the Sub-con land of Mario 2 (which all you good little Mario-philes know was actually the Japanese game Doki Doki Panic). The music is non-existent. Instead, music is recycled from the SNES Mario World game in each level. 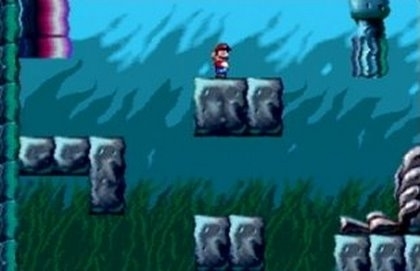 The familiar moves featured in Mario World are also MIA in this prototype, but the character models would suggest Nova Logic was attempting to keep this in the same bane as its predecessor, so it is assumed those moves would be employed further into development. In short, this is an interesting piece of Mario trivia, and may have been the only worthwhile game in the platform genre for this pathetic system. Maybe someone will decide to finish this by modding the engine and releasing it for another system. Cast your mind back 10 years and the veteran gamers amongst us would remember a time of two video game giants waging a war over supremacy for the 16-BIT platforms. Competition was fierce and of course you needed a mascot, SEGA had Sonic the Hedgehog and Nintendo Shigeru Miyamoto's ingenious Mario creation. It would have been unthinkable to see these symbolic characters on other platforms but in Mario's case it happened. After a break down in communications over the agreement between Nintendo, Sony and Philips to produce a CD add on unit for the SNES, Sony walked away with the PSX and Philips an agreement to produce 4 Nintendo licensed games including characters such as Zelda, Donkey Kong and Mario. Philips capitalised on this agreement by simultaneously releasing two Zelda games on its CD-i platform, "Link: The Faces of Evil" and "Zelda: The Wand of Gamelon" both considered a terrible waste of a popular gaming franchise. The third installment in the series "Zelda's Adventure" was a reasonable game but came too late and was overshadowed by the failings of the previous two outings. 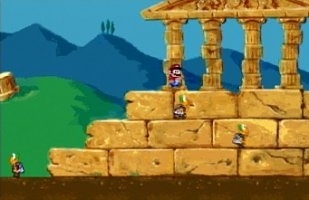 The final release was "Hotel Mario" a fair attempt to revive interest in the licensing flops. It never made a high impact on the CD-i charts and ultimately failed to ship any quantity of CD-i units to reverse the obvious decline of the platform. Even though these licensed games were supposedly developed away from Nintendo we have heard some rumor that Nintendo had a strong hand to play in the games eventual gameplay mechanics. Which leads to the question over how restricted the developers were when producing these Nintendo licensed games and why didn't Philips cash in on the Donkey Kong license. 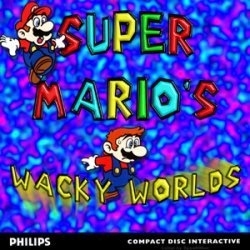 Even less well known, a title developed by Novalogic called "Super Mario's Wacky Worlds" for the CD-i, which was never fully developed, a lost Mario game. Programmer on the project, Silas Warner comments "Novalogic was seeking work from Nintendo, we had already produced one Nintendo cartridge. A Nintendo sales executive came up with the idea that maybe simple Nintendo titles could play on the CD-i. I suspect he was thinking of some kind of adapter to plug a Nintendo cartridge into a CD slot! But it set off a frantic race at Novalogic. The project was to put a popular Nintendo game, Super Mario World onto a CD-i disk." It's clear that Nintendo instigated the project although probably didn't have Miyamoto's Mario in mind as a possible conversion. Nevertheless the results of Novalogic's development team was impressive. The simple gameplay mechanics stay faithful to the original SMW, with no obvious differences in an early prototype version of SMWW. Nina Stanley, lead artist on the project comments, "It was intended to be part of the Mario series, and as far as I was aware, a sequel or follow up to SMW. It needed to be as much like Mario on the SNES as far as handling and game mechanics." Silas adds "The characters were pirated from a video feed, the level maps drawn off on paper, and John Brooks and I prepared to put in 24-hour days for two weeks. At the end of that time, we had a little bit of one level done, enough to display at an upcoming Nintendo developer meeting. The disk was burned at 4am on friday morning for an 8am meeting." Which leaves the question, why was the game never completed? "The effect was just what was expected. Nintendo marveled and applauded the marvelous job we had done in two weeks, then killed the idea. The CD-i wasn't selling. The project was over, and I went looking for new work." adds Silas. The story of SMWW doesn't end there. Novalogic pushed on with the project "about 80% of art, 95% of design and maybe 30% of code was finished at project termination. I do not know the exact circumstances, but I do know that we seemed to be a bit understaffed on the project and I felt a little like the poor stepsister to the Commanche products, which were Novalogic's main focus." said Nina. One enduring theme is there absolute respect for Shigeru Miyamoto, "The development team had great admiration for the Super Mario games and wanted to create something that would feel natural to players of Miyamoto's masterpieces. Our design goals were to bring high quality graphics and sound into the Mario world, along with diverse themes and creative gameplay experiences." said John Brooks, lead programmer. It would have been intriguing to see how SMWW would fare on CD medium during a time when it wasn't a particularly accepted format within the video game industry, Nintendo especially against the leap from cartridge to CD. John elaborates, "The huge CD was hundreds of times larger than ROM cartridges of that era. The nearly unlimited art and audio content allowed great variety within each level (256 color bitmapped graphics and high quality audio streamed off of CD), as well as great diversity between levels (6 distinct worlds with 6 levels per world). Marty Foulger, of Dragon's Lair fame, was a prolific designer who created unusual puzzles and worlds for Mario to explore. Marty Foulger, lead designer outlines the games brief, "Our goal was to clone Nintendo's Super Mario World with new characters and locations, but use the interactivity familiar to SMW gamers. The CD-i hardware imposed some severe limitations, but we identified the core game mechanics that we thought we could implement, and designed a game around them. We used one of the SMW cheat books that diagrammed all of the levels and mechanisms in the original. Some of them we adapted and others we created new mechanisms altogether. The improvements over SMW would be more depth and variation in the backgrounds and characters due to the large capacity of the CD and more flexibility in game music and sound effects that were stored on the disc, rather than synthesised." Evidently this was quite a different project compared to the other Nintendo licensed games on the CD-i, which altered the game mechanics to an unrecognizable state to Zelda and Mario fans. Marty adds " We knew that the value of the Mario license lay in the devotion of the fans to the games they knew and loved. Our intent was to use familiar themes and mechanisms combined with creative new environments and characters to create a new game that would appeal to the same fan base. It was not the best use of CD-i in that the hardware was never intended to produce a sprite-based game; however, we had been charged with the difficult mission of making a Nintendo-style Mario game and through the incredible technical work of John Brooks, it was well on the way to achieving that goal." SMWW had been in development from early 1992 for an entire year until version 0.11 was burned to CD on 03-03-1993 which is the final known prototype to exist, although far from complete. Still questions remain, why was the project so short staffed and why was this amazing piece of software never developed into a full game and finally released. Marty reveals some insight into the possible motivations behind senior management at Novalogic "I was not involved in management decisions regarding resource allocation, but from my perspective, it appeared that the intent was to produce the title with the smallest expenditure of resources as possible. Philips was spending an enormous amount of money on CD-i titles at that time and Novalogic used SMWW as a cash cow to fund Commanche and other internal titles that they intended to publish themselves at a greater profit than development-for-hire titles like SMWW. In fairness, they were no different than dozens of other developers that stuck their hat under the Philips spigot to make some easy cash." So at least we know why Novalogic refused to comment on there participation in the project. Whatever managerial decisions were made at Novalogic for SMWW, this does not detract from the enthusiasm behind the games development staff. SMWW stands as an amazing piece of technical engineering for what could have beeen a great game on the CD-i. It remains a much sought after curiosity to Mario and CD-i fans alike. Three prototypes are known to exist in the RetroGaming circuits one of which sold on ebay for $1000, it's doubtful that we've heard the end of this story but hopefully this article makes a fair and accurate attempt at describing one of many interesting facets in CD-i gaming history.